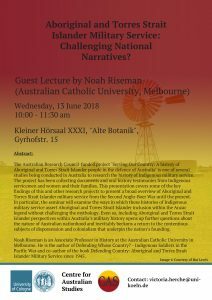 Noah Riseman is an Associate Professor in History at the Australian Catholic University in Melbourne. He is the author of Defending Whose Country? Indigenous Soldiers in the Pacific War and co-author of the book Defending Country: Aboriginal and Torres Strait Islander Military Service since 1945. 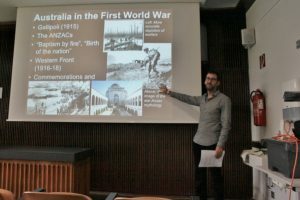 The Australian Research Council-funded project ‘Serving Our Country: A history of Aboriginal and Torres Strait Islander people in the defence of Australia’ is one of several studies being conducted in Australia to research the history of Indigenous military service. The project has been collecting documents and oral history testimonies from Indigenous servicemen and women and their families. 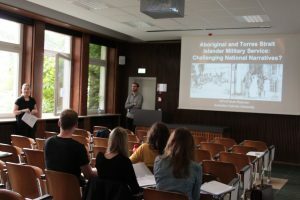 This presentation covers some of the key findings of this and other research projects to present a broad overview of Aboriginal and Torres Strait Islander military service from the Second Anglo-Boer War until the present. In particular, the seminar will examine the ways in which these histories of Indigenous military service assert Aboriginal and Torres Strait Islander inclusion within the Anzac legend without challenging the mythology. Even so, including Aboriginal and Torres Strait Islander perspectives within Australia’s military history opens up further questions about the nature of Australian nationhood and inevitably beckons a return to the contentious subjects of dispossession and colonialism that underpin the nation’s founding. Wednesday, 13 June 2018, 10:00-11.30, Kleiner Hörsaal XXXI, “Alte Botanik”, Gyrhofstr., 15 (basement). An abstract will be uploaded as soon as possible. Click here for the flyer.